First Lieutenant Arvin began his tour in Thua Thien Province, South Vietnam on May 29, 1967 serving with Advisory Team 162, 7th ARVN Airborne Battalion, Military Assistance Command Vietnam (MACV). According to a note on the Virtual Wall, "First Lieutenant Arvin received two awards of the Silver Star Medal, the first for an action on September 5, 1967 when the 7th Vietnamese Airborne Battalion...came under intense mortar and small arms fire. Though wounded, Arvin disregarded the fierce fire and was leading his element forward to engage the enemy when his radio operator was also wounded. Arvin dragged the soldier to safety and, undaunted by the perilous circumstances, returned to direct repeated helicopter gunship strikes. He refused his own medical evacuation until the objective was secure and the mission complete.
" The note continues, " After a brief period of hospitalization, First Lieutenant Arvin requested an immediate reeturn to duty. The second award resulted from actions which led to his death, 'On October 8, 1967, his unit was completing a sweep of a suspected enemy base when it encountered an entrenched enemy regiment. Intense enemy fire pinned down Arvin's Battalion in an exposed, untenable position. In full view of the enemy, he valiantly moved through the fire to a forward vantage point. There, as fighting raged about him, he directed extremely accurate, close-range gunship passes onto enemy positions. As he continually moved through fire-swept fields to position himself better to direct the supporting fire, Arvin was mortally wounded. His unremitting attention to duty and superb direction of ground forces and supporting aircraft had enabled his battalion to defeat a strong and determined enemy three times its size.'" First Lieutenant Arvin was promoted posthumously to Captain. 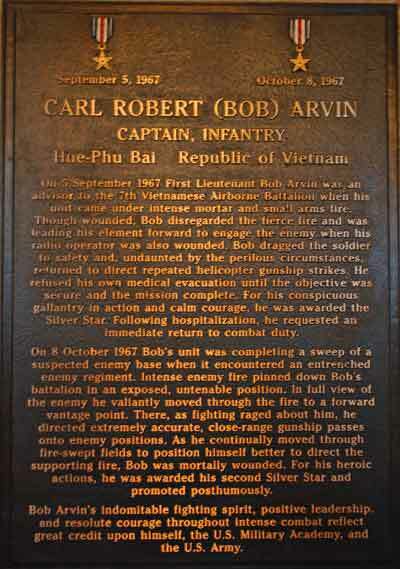 Captain Carl Robert Arvin is survived by his parents, wife and a brother. Captain Arvin is resting in West Point Cemetery with two other 1965 classmates who were killed in Vietnam. He lived 24 years, 8 months and 19 days. 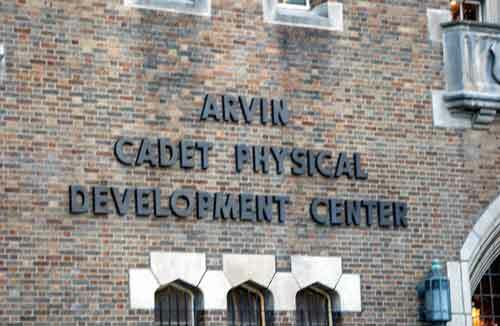 In 1988, a new cadet gymnasium at the U.S. Military Academy was named in his honor. 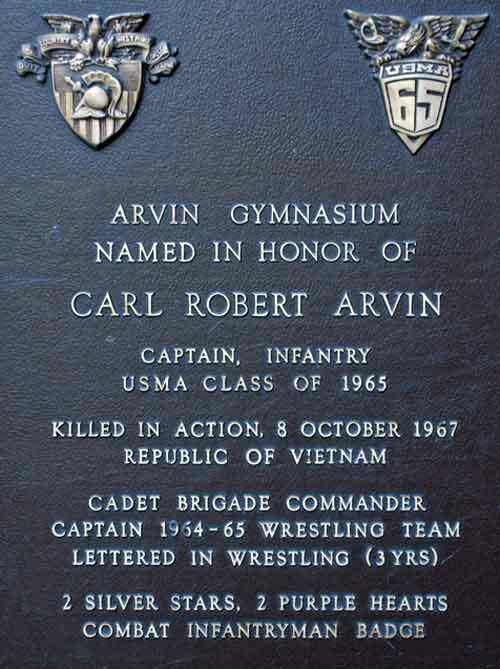 Carl Robert Avins name is listed on the Vietnam Memorial in Ypsilanti Township under Ypsilanti. His name also appears on the Vietnam Memorial in Washington, DC on Panel 27E Line 068. The President of the United States takes pride in presenting the Silver Star Medal (Posthumously) to Carl Robert Arvin (OF-104601), Captain (Infantry), [then First Lieutenant], U.S. Army, for conspicuous gallantry and intrepidity in action while serving with Advisory Team 162, Military Assistance Command, Vietnam, in action against the enemy on 5 September 1967 in the Republic of Vietnam. On that date, Captain Arvin was serving as Advisor to the 7th Vietnamese Airborne Battalion when it came under intense mortar and small arms fire. Though wounded, Captain Arvin disregarded the fierce fire and was leading his element forward to engage the enemy when his radio operator was also wounded. Captain Arvin dragged the soldier to safety and, undaunted by the perilous circumstances, returned to direct repeated helicopter gunship strikes. He refused his own medical evacuation until the objective was secure and the mission complete. Captain Arvin's personal bravery and devotion to duty were in keeping with the highest traditions of the military service and reflect great credit upon himself, his unit, and the United States Army. 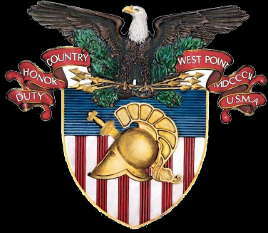 The President of the United States takes pride in presenting a Bronze Oak Leaf Cluster in lieu of a Second Award of the Silver Star Medal (Posthumously) to Carl Robert Arvin (OF-104601), Captain (Infantry), [then First Lieutenant], U.S. Army, for conspicuous gallantry and intrepidity in action while serving with Advisory Team 162, Military Assistance Command, Vietnam, in action against the enemy on 8 October 1967 in the Republic of Vietnam. On that date Captain Arvin's unit was completing a sweep of a suspected enemy base when it encountered an entrenched enemy regiment. Intense enemy fire pinned down his battalion in an exposed, untenable position. In full view of the enemy Captain Arvin valiantly moved through the fire to a forward vantage point. There, as fighting raged about him, he directed extremely accurate, close-range gunship passes onto enemy positions. As he continually moved through fire-swept fields to position himself better to direct the supporting fire, Captain Arvin was mortally wounded. His unremitting attention to duty and superb direction of ground forces and supporting aircraft had enabled his battalion to defeat a strong and determined enemy three times its size. Captain Arvin's personal bravery and devotion to duty were in keeping with the highest traditions of the military service and reflect great credit upon himself, his unit, and the United States Army.